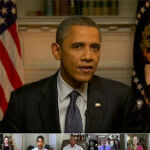 President Obama held another Google+ Hangout today and answered questions on a number of topics, and a couple of the items on the table today were topics very close to our hearts here at PhoneArena. The president talked about patent reform, saying it has only gone "about halfway to where we need to go", and unfortunately he avoided the topic of unlocking phones. The folks that you're talking about are a classic example. They don't actually produce anything themselves. They're just trying to essentially leverage and hijack somebody else's idea and see if they can extort some money out of them. Sometimes these things are challenging. Because we also want to make sure that patents are long enough, and that people's intellectual property is protected. We've got to balance that with making sure that they're not so long that innovation is reduced. Of the 10 most popular questions voted on for the president, the 8th most popular concerned the legality of unlocking or modifying phones. It asked, "Mr. President, would you support a small, targeted fix to copyright law that allows folks to use the devices and digital media that they have already paid for, however they like, and for their own personal use?" Unfortunately, the president was never presented this question, and so did not comment on it. The petition concerning unlocking cell phones is still about 32,000 signatures short of the 100,000 needed to require a White House response on the issue. The petition expires on February 23rd, so share that petition as much as you can before then, and maybe we can get a real response on the question. You can watch the full Hangout below. The comments about patents comes around 43 minutes in. I love to hear Obama says the patent need to stay as long as they can and avoid the unlocking issue so that people will go to the apple store to buy unlocked device... Right fandroid? You should familiarize yourself with the word, "Troll". I'm starting to question if you have a central nervous sytem. Because he was never asked about Unlocking devices lol. I watched the whole hangout Live, he was asked about how he's going to help control patent abuse, not anything specific to mobile devices. Yet days earlier he gave a shout-out to Tim Cook, I'm thoroughly confused. This sounds like a case of greased palms. Here's the problem. He wants to make sure patents last long enough?! Most patents last around 15-20 years. Fine for most industries, but in the tech world (computers, cell phones, media players, software) that's a lifetime. Look at half that period - 10 years. Compare cell phones from 2003 to today. HUGE difference. At most for this sector I'd say 5 years. That's plenty of time to make a profit off the patent if there's money to be made. He's not trying to make patents longer. What he is saying is that there need to be a better balance. I huge companies shamelessly abuse the patent system after borrowing from other companies themselves *cough* Apple *cough*cough* Disney. But also what he is saying is that the patent system is a very important thing and shouldn't be shortened to an unreasonable length. It's a good thing that he is acknowledging that there does in fact need to be a lot more reformation in the patent laws but, I doubt he has any time to legislate for that though. Besides it's all up to congress as usually and you know how dependable they are at making decisions.